Sunday after work, my brother and I drove down to Death Valley for a shakedown hike and to escape the cold of Mammoth Lakes for a few days. The first night we car camped off a 4×4 road and cowboy camped as we attempted to hide from the high winds that were blowing through the valley. The ground was covered in desert vegetation and I ended up puncturing my sleeping pad right away. This was quite frustrating but luckily, Nick had thrown two Z-Lites in the vehicle so we both proceeded to use these for the rest of the trip. 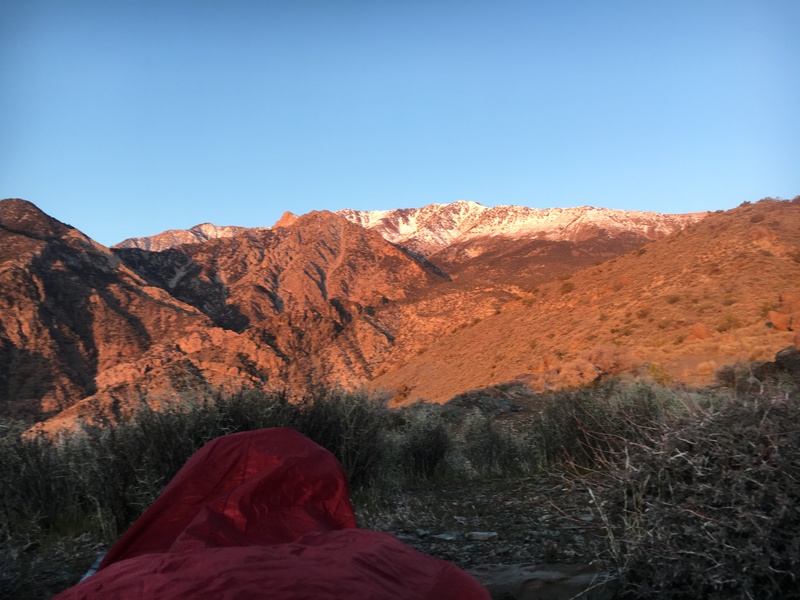 Lessons re-learned; be aware of where you’re placing your sleeping pad, there are some things you can’t control and sometimes you just have to make do with what you have. The next morning we parked at the end of Hanaupah Canyon and started our hike into it. I was looking forward to spending a few days outside and testing out some new gear while seeing if my older gear could manage. Below are a few of the items of gear that stood out to me, old and new, and some of my overall impressions from the hike. 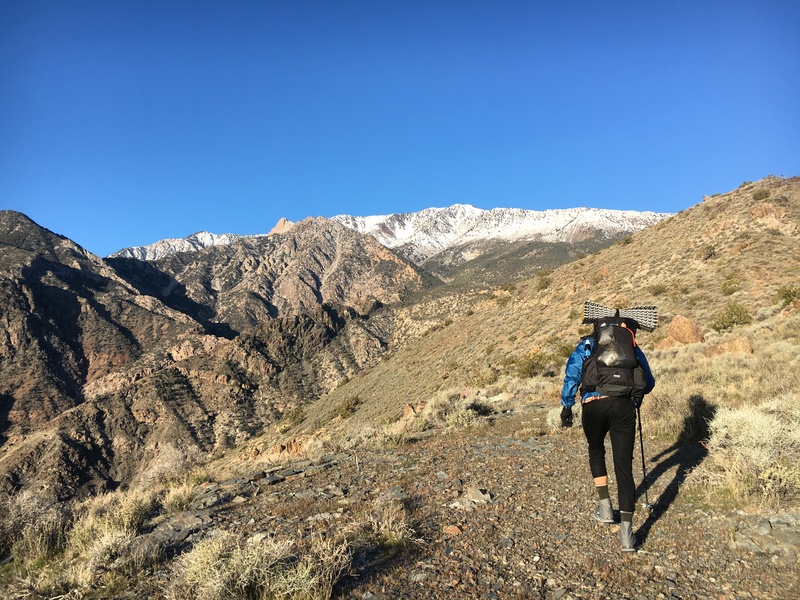 Hiking towards Panamint Ridge on day 2 of our hike. My summer bag and my go-to in recent years has been a Western Mountaineering HighLite 35 degree. I used this bag on the Appalachian Trail in 2014 and have slept in it countless times since. Recently, I purchased a Western Mountaineering HotSac to compliment it on those cooler nights and have used it a couple times since. The first night of our walk into Hanaupah Canyon, we camped on a ridge that was at 5000’ elevation. It was windy the whole day but thankfully, it died down as the sun set just after 7 o’clock. We both cowboy camped as to avoid the trouble of setting up tents in the wind and to get a good view of the night sky. It also helps me get up with the sun as there is no tent to hide in and pretend the sun isn’t up. That first night it got down into the thirties and by the morning I was doing sit-ups to stay warm. I have flirted with the idea of getting a 20 degree quilt for quite a while now and this trip confirmed my concerns that a 35 degree bag would not be warm enough for the duration of the Continental Divide Trail. I’m sure I could have made it work and scraped by, but I want to have the ability to cowboy camp on ridgelines without having to do sit-ups to stay warm. Waking up to this view was well worth the chilly night. Recently, I ordered a 20 degree Enigma quilt from Enlightened Equipment and am looking forward to using it on the trail. The Enigma has an enclosed footbox, comes packed with 850 DownTek treated down and comes in at 18 ounces. This is going to be warmer and lighter than my 35 degree bag plus liner combo and seemed like a necessary investment. The Nemo sleeping pad I will be using worked just fine last summer when I went backpacking and I just patched it up so it will be good to go for the hike. When I bought my sleeping pad, I also picked up a Hornet 1P tent and have been really pleased with its design. I must do well to remember to treat my gear with care as it is all I have out there and it needs to last me five months! Something new I tried out on this trip was the art of cold soaking meals for dinner. 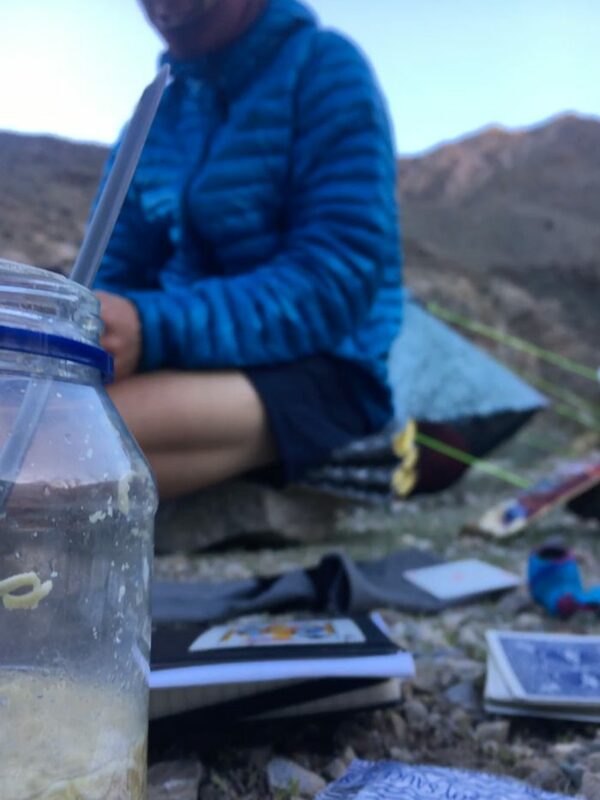 Nick had done this during the latter part of his PCT hike in order to simplify his eating and drop the weight of a cooking system. During my recent hikes in the Sierra I would always carry a stove for dinner and a nighttime or sunrise tea. The idea of not eating hot food while walking through the desert makes sense to me and I will attempt to do this for the duration of the hike. Instead of cooking for dinner, I had couscous one night and a ramen bomb (packet of ramen and mashed potato flakes) the next. Tick, tick, boom! Preparing a ramen bomb and playing rummy. After a long day of hiking, I just want calories to re-fuel my body and am not too worried about taste. I’ve had plenty of cooked pasta sides in my hiking life and am good to take a break from those for a bit. On the AT I carried a bottle stove that used denatured alcohol for fuel and a pot to cook with and eat out of. Going without a cook system drops my base weight quite a bit and it is also just one less thing to worry about. In town, finding fuel is not a factor and that is something else I don’t need to think about when resupplying. For this thru hike, I will be using a Waymark Gear Company pack and this was my first time taking it out for a backpacking trip. This beaut has been hanging on the coat rack in my room, patiently waiting to be taken out for a long hike. It is a frameless pack and has 50 liters of storage. I am also happy to be representing Waymark Gear Co as a trail ambossador for this hike. The great thing about the Waymark packs is that you can customize every bit of it. Slightly overwhelming at first, but the designing part was enjoyable as I chose the fabrics, colors and pockets that would best suit what I wanted out of a backpack. Still trying to figure out how to pack it, hence all the random things stuffed into the front pocket. The pack fit extremely well but I am already starting to think I could have done with a 40 liter pack. 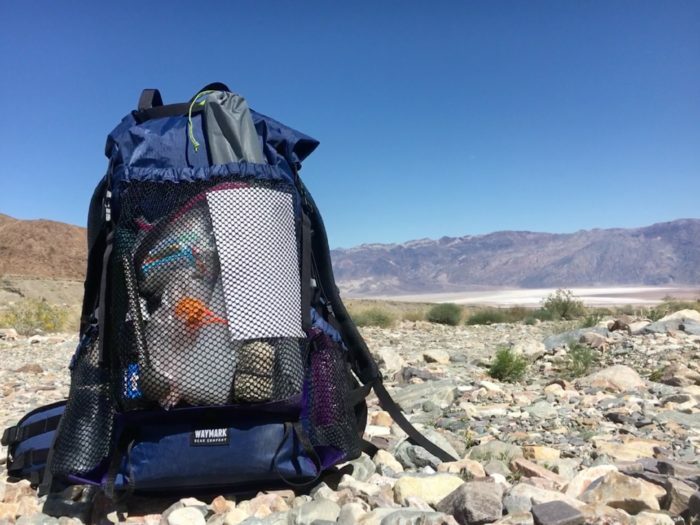 However, fifty liters will be nice for when I am carrying four or five days of food and there could be some decent water carries throughout the desert. My pack also features a bottom pocket which is easily accessible while walking. During the hike it held snacks and my buff when it wasn’t around my neck. During the first and last day of the hike I put a Thermarest Z-Lite against my back for added support and comfort. During the second day, I strapped the Z-Lite on top of the pack instead and too many times was I taking my pack off to adjust things that were poking me in the back. While I like the shape of the pack, the Z-Lite back padding does a lot for overall comfort and I will be starting the trail with 4 panels as back support/seat pad/padding for my lower half while sleeping since my sleeping pad is not full length. It had been a couple years since my brother and I went on a backpacking trip together. 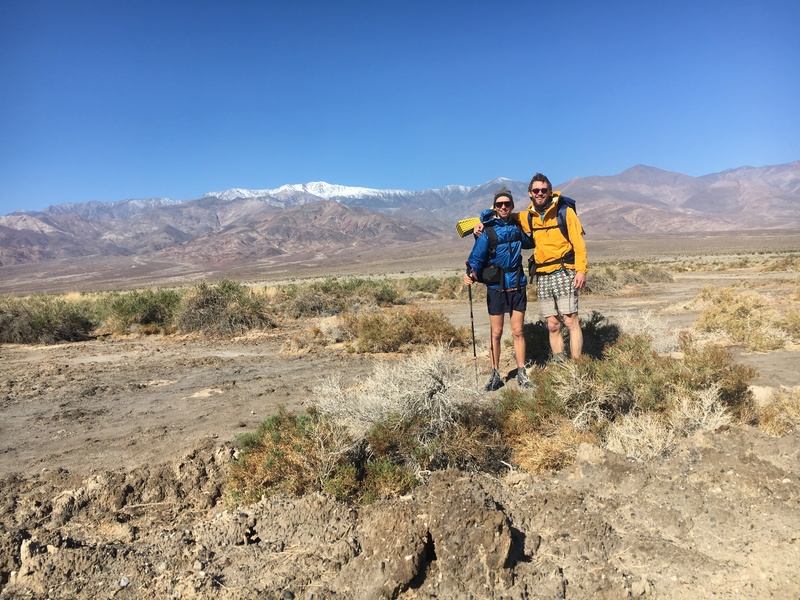 Last time was actually two years ago (also in Death Valley) for the superbloom and as a shakedown hike for him as he was preparing to hike the Pacific Crest Trail that summer. Let me say that his hiking ability still impresses the hell out of me. He is just as comfortable going up and down hills as he is walking on flat ground. After two thru-hikes, Top Nach seems right at home when walking trail, scrambling ridgelines and cold-soaking couscous for dinner. It made me realize that I’m a little rusty when it comes to multi-day resupplys and hiking multiple mountains in one day, but am excited to practice a bunch this summer. However, I am not worried as we will be more than fine once we get out on the trail for a couple weeks and fall into the rhythm of the hike. We made it all the way up to that snowy ridge in the background, gaining over 10,000 feet in the process. Just under a month till we take the shuttle to the border to start our hike. The shakedown hike was needed to test out gear and our bodies but it was also nice to get out of town for a bit before these last two weeks in Mammoth Lakes. The anticipation grows everyday as I do my best to stay grounded and present. It will be a bittersweet goodbye to this town and the people that have helped make California my home for the past three years but I know I will see all these beautiful people again as it is just goodbye for now. I have begun walking to work and back just to get the exercise and to get my fill of walking for the day. It is warming up as spring slowly rolls in and the days get progressively longer. Usually I take the bus to get to the brewery where I work, but it is only a mile and a half away from my house and takes 20-25 minutes to walk there. It is also good for the mind to be alone for a bit every day to let my brain rest as I prepare myself for work or to decompress after a long shift. I am enjoying every moment here while I can and am excited to get back out on the trail for an extended period of time.